CCNA Security Study Guide offers comprehensive review for Exam 210-260. Packed with concise explanations of core security concepts, this book is designed to help you successfully prepare for the exam. Expert instruction guides you through critical concepts relating to secure network infrastructure, access management, VPN encryption, Firewalls, intrusion prevention and more, with complete coverage of the CCNA exam objectives. Practical examples allow you to apply your skills in real-world scenarios, helping you transition effectively from "learning" to "doing". You also get access to the Sybex online learning environment, featuring the tools you need to maximize your study time: key terminology and flash cards allow you to study anytime, anywhere, while chapter tests and practice exams help you track your progress and gauge your readiness along the way. Earning your CCNA Security certification validates your abilities in areas that define careers including network security, administrator, and network security support engineer. With data threats continuing to mount, the demand for this skill set will only continue to grow—and in an employer's eyes, a CCNA certification makes you a true professional. 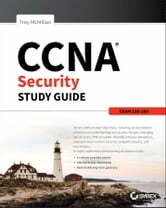 CCNA Security Study Guide is the ideal preparation resource for candidates looking to not only pass the exam, but also succeed in the field.